Pictured right: Funding Strategies for Individual Artists, presented by Fresh Arts. 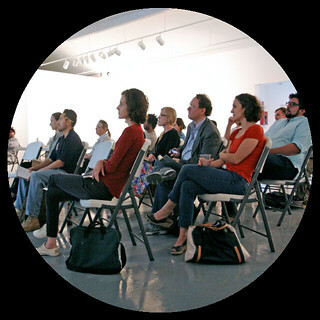 Fresh Arts' career building workshops offer Houston’s artists and emerging arts organizations a “nuts and bolts” approach to their creative business, supplying them with the knowledge and take away resources to immediately put what they’ve learned into action. Our past workshop curriculum has covered a variety of topics including arts marketing, finance, fundraising, creative licensing, healthcare, and other business fundamentals. Since 2009, Fresh Arts (formerly Spacetaker) has hosted 115+ workshops and served nearly 3,500 artists through its professional development programs. Signup for Workshop email updates HERE. Join Fresh Arts and Artist INC facilitator GONZO247 for a free workshop and introduction into the cutting edge program Artist INC-HOUSTON. In the “What Works Workshop”, we will share case studies from working artists about "What Works/What Doesn't" for artists to create sustainable careers and discuss the common behaviors of successful artists’ entrepreneurs and leave you ready to apply them to your own art practice. This is an encore presentation of the 12/19/18 workshop. A 2nd version of this workshop will be hosted in SPANISH. Thanks to Talento Bilingue de Houston for hosting us! Texas Accountants and Lawyers in the Arts (TALA), in partnership with Fresh Arts, will offer a free legal clinic for artists and arts-related nonprofit organizations who meet income eligibility guidelines and have legal questions related to the creative sector. Musicians, artists, and representatives of arts nonprofit organizations will be provided up to 30 minutes consultation with a legal professional. •	Business v hobby rules, etc. Join Fresh Arts and the Independence Heights Redevelopment Council for an info session on local resources to help support your artistic business and community art projects. Hosted in in partnership with City of Houston District H council member Karla Cisneros. Thanks to Winter Street Studios for hosting us! Follow Fresh Arts on Facebook for updates on future programming! Fresh Arts members receive 50% discounts on all workshops! Click HERE for more info.